Davido’s Baby Mama, Sophie Momodu Consoles Him Following Murder Allegation. Remember that Davido had been under fire lately, after he was dragged into a murder case following autopsy revelation of his friend. 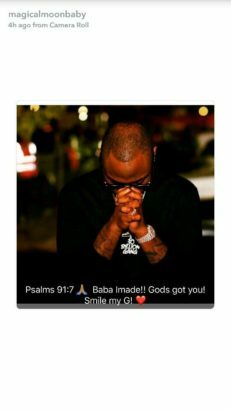 Davido’s baby mama, Sophie Momodu who shared a photo of him down with worry on Snapchat, asked him to smile cos God’s got him.